Star Wars' C3PO, actor Anthony Daniels, has admitted that he's not a big fan of 3D television, insisting he doesn't like things coming out of his TV. Although the British thespian is a fan of 3D when it's used in big theme park productions, he's unconvinced by its use in the home. "One of the projects I have just been involved in is Star Tours," he told a press conference launching the Star Wars saga on Blu-ray. "That is in a 60 seat flight simulator where people go on a voyage around the planet and everyone wears 3D glasses. "The effects are stunning and relevant and real – because you're apparently looking through a view port. "I slightly have a problem with sitting in my own sitting room and being surprised by things coming into the room. I don't expect things to come out my television!" he continued. "I'm quite happy, in a luddite kind of way, to see things on a [2D] screen." 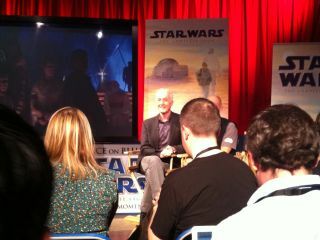 But Daniels is more of a fan than Star Wars' stunt co-ordinator Nick Gillard who said: "I hate 3D!" "I saw Avatar on non-3D and I thought it was pretty average." It will be interesting to see if either of them is rolled out for the launch of the Star Wars 3D Blu-rays in a couple of years' time!